Raymond began to develop our perfume with Ben Bridge and a modern classic woman in mind. The first time I was able to experience the start of the fragrance was when Raymond presented the fragrance accords (the notes that make up the perfume). He described them in terms of our stores. He connected one accord to the color and energy in the store, one to the romance and feminine nature of jewelry, and the third to the wood in our stores. He drew his inspiration from the nature of our business, our stores, and our associates. After a few months and countless formulations, we decided upon a small bottle labeled “10” (the geeky gemologist in me loved that it was the same number as a diamond on the Moh’s scale of hardness. It had to be a sign, right?). Every time I smelled it, I smiled. This had to be the one! Once we had the fragrance, I began carrying it with me in my purse. I shared it to see what the reactions would be. To my great pleasure, I received hardly anything but rave reviews. Many of my friends have been asking when they can get their own bottle! It is a fresh fragrance that is wearable day or night. I always thought that naming a product would be fun and easy. I was quite wrong. It was fun, but not very easy. Each time I got excited about a name, someone was already using it. I started to get discouraged until ‘Flawless’ was mentioned. It was just perfect. Completely tied to the diamond merchandise we have been selling for years, Flawless made sense. It also felt crisp, like our fragrance smelled. I asked for opinions and Flawless was the overwhelming winner. The brilliance of a diamond in a bottle. A fresh, modern fragrance, full of whimsy, sparkle, and romance. I am very excited to have found the perfect (eco-friendly) packaging for FLAWLESS. The bottle looks like an upside-down diamond, with a Ben Bridge Signature Diamond shaped cap. Different than most other bottles I’ve seen, it is clean and embodies the name of the fragrance. It will look great sitting on people’s vanities and dressers (it will look significantly better on mine than the test bottle I have sitting there now). The box opens like a ring box, showing off the bottle, and diamond shape sitting within. The whole project is finally coming to fruition. It’s still a bit hard to believe that people will be able to purchase, wear, and enjoy FLAWLESS, it’s no longer just an idea. It has been a long time coming, but I cannot wait for you to experience FLAWLESS, the brilliance of a diamond in a bottle! 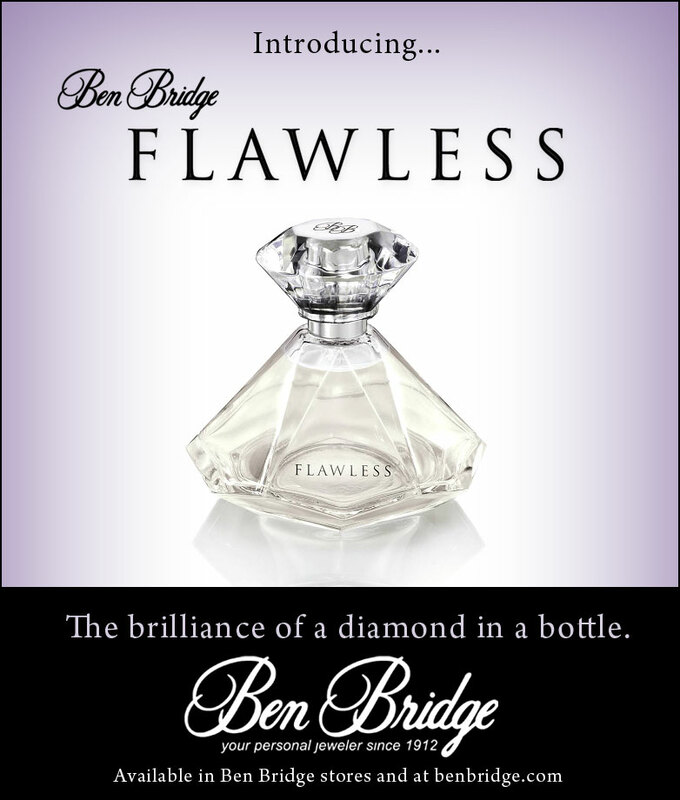 I cannot tell you how excited I am that you can now experience Ben Bridge’s first fragrance: FLAWLESS. This project has been my baby over the last year, so I’m excited for it to be available in stores! Having grown up in the retail business, I love the whole retail experience. Some of my friends give me a hard time for veering towards jewelry stores whenever we walk by one. In July of 2009, I walked in to a couple of different stores that made me think about the experience in a Ben Bridge store and how we could make it better. One store I walked into in Beverly Hills had a distinctly good smell. It was very light, but it created an elegant atmosphere in the store. The other was a beautiful blouse store in Boston. Each blouse had a sachet attached, and before I tried on anything, the sales associate sprayed each item with a scent. The romantic scent made the experience that much better; I was enveloped in the luxury of the store. I began to think about what our stores smell like, and what scent people associate with Ben Bridge. We didn’t have a uniform scent. We build gorgeous stores, with beautiful jewelry, we have candy and coffee available, good lighting for seeing diamonds, but there wasn’t a consistent smell. Jewelry and fragrance are both inextricably linked to memories and emotion. I will never forget receiving a diamond pendant for my 18th birthday, or the way my mom smelled growing up. What if someone was able to wear their Ben Bridge Signature Diamond ring with their Ben Bridge perfume? If every time they put on the perfume, they thought of the special moment they were given a piece of jewelry? How would this enhance the experience in our stores? Could we make giving or receiving a gift from Ben Bridge more memorable? Excited about embarking on this journey, we began to develop this signature fragrance with the help of a number of experts. Our fragrance designer, Raymond Matts, came to us after creating such iconic scents as Clinique Happy and Elizabeth Taylor White Diamonds. Although we had spoken and I had sent him a packet of information about the company and who we are, there isn’t anything quite like walking in to one of our stores and meeting our associates. So he flew out to Seattle to get to know Ben Bridge. While in Seattle, Raymond talked with a number of people in the office to understand BB and how the fragrance would fit in to the company. He also brought along a selection of fragrances to get reactions. As fragrance is so personal, he wanted to understand general likes and dislikes. Later in the day, Raymond visited a couple of Ben Bridge stores. In the morning he heard about who we are in theory, but in the afternoon he saw it in action. I couldn’t wait to see how all of the information we shared would turn in to a fragrance. “I’m here to talk about a Tungsten ring I really like. It’s this particular one right here. It’s actually 8mm wide and all Tungsten with a satin finish, which gives it a two-tone look that honestly goes great with my jacket. Most guys wear a lot of blacks and grays and it goes really good with that. Plus, while maybe not all guys like a diamond, but sometimes deep down inside they still want one, this kind of has the best of both worlds, where it has a small one but you don’t always have to show it. You can turn it around and it just has a nice plain straight line look. It’s comfort fit so it slides on and off the finger very easily. It’s a great ring its got a nice weight to it easily for guys.